Allt för Sverige Now Casting. Do you have Swedish ancestors? 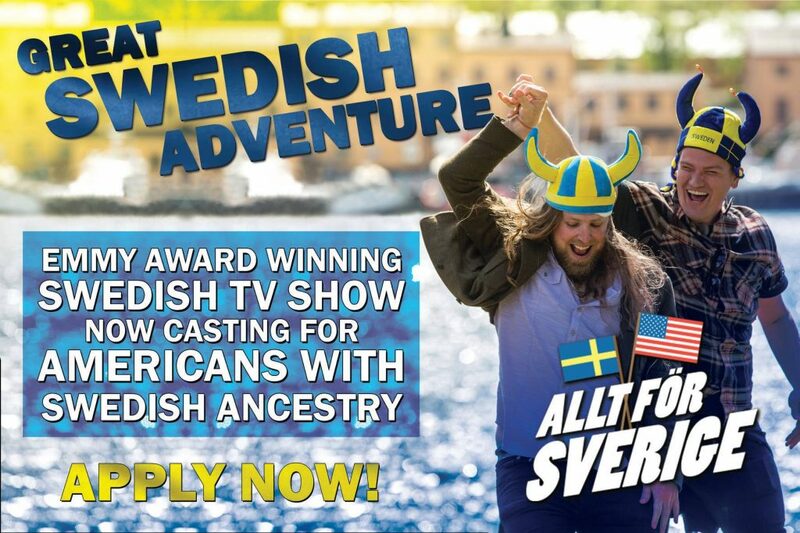 A Swedish production company is casting nationwide for Americans that would like to travel to Sweden and re-discover their heritage. The show will be filming during the summer of 2019. The Producers of the Swedish version of “American Idol” and “Minute to win it” are coming to the U.S. to find fun, outgoing Americans with Swedish ancestry to participate in “Allt för Sverige” season 9. The show focuses on taking Americans to find their Swedish heritage and films in Sweden. The show Showcases everyday Americans as they journey throughout Sweden to discover their land, roots and cultural heritage. Casting is Open through January 2019. Deadline to apply is January 20th, 2019. This is an incredible “once in a lifetime” opportunity for someone to discover their ancestry and experience their rich and fascinating Swedish cultural heritage. Here is a clip from season 1 of the show. They are now casting for season 9. Hello, my name is Mike Hugill. I just saw your casting call and then with some disappointment, see that you closed the auditions 5 days ago. It is now January 25th. I am of Swedish descent with my mother’s maiden name HEDMARK and her mother a LINDQUIST and a Bjorklund before her. I will just throw this out for consideration.